Individual benches, concrete balls, spikes on the floor, inclined sills, bars… are some of hostile architecture that we find in big cities and suppose a right violation for homeless people. From Arrels, we claim for inclusive cities and residential solutions so nobody has to sleep on the street and we invite you to make visible the barriers of your environment on social media and in this collaborative map. “Iron bars on the bus benches, spikes on the floor, individual benches… are they the solution to stop seeing people who sleep on the street?”. This is what some people we know asked themselves some months ago and that have lived on the street. From Arrels, we think that these architectural barriers are not the solution because the problem doesn’t disappear, it is only moved. They involve additional difficulties for people and suppose a vulnerability of rights. How they affect to people who sleep on the street? They complicate the daily life. Living on the street means not having a safe place where to rest, a place to save your belongings, to enjoy your privacy… It also means having to confront a lot of risks every day and architectural barriers are an added difficulty most of the times. Luís, who lives on the street for many years, considers that are “horrible even unethical”. On the other hand, the civility ordinance of Barcelona adds up another obstacle and bans “using benches and public seats for different uses to which they are made for”. They increase stress and anxiety. When you live on the street you have to confront fear every day, insecurity and lack of rest. With these barriers the sensation that the society rejects you and the stress of having to find a new and safe place is also added up. “For someone living on the street is disagreeable in view (and in body) to see that spikes are placed where that person sleeps”, says someone we know. They suppose a vulnerability of rights. Living on the street means having to find a safe place where take shelter and feel protected. When these barriers prevent it, a lot of people’s right are being violated. A man we know, however, keeps sleeping in the same doorway where he has been sleeping during the last seven years, even though months ago gardeners were placed so he couldn’t lay there. When the local police reprimand him because his legs are in the way, he answers: “Cut them off if you want so they won’t disturb”. They make difficult to locate by the street teams. When a homeless person is forced to change his usual place, he is exposed to lose his bond with the support social teams that visit him on the street. Get able to locate again the person and re-establish the contact can suppose time because of the lack of communication routes. They criminalize people. People are not on the street because of their will, but because they don’t have a place to live. They are not in these situations because they deserve it nor they looked for it. These boundaries, besides of the discomfort and the difficulties of living on the street, criminalize the most vulnerable people. They don’t act on the causes. Architectural boundaries, more than offering solutions, move the rest areas and make invisible the social problem. “It is a sad way to understand the public area, expelling people with problems instead of resolving them”, says someone who has lived on the street. And what do we suggest from Arrels? We claim kind and committed cities, with welcoming and inclusive public areas. “Instead of placing spikes, bollards and more barriers so a person can’t sleep on the street, there should be more shelters and resources”, claim different people who have lived on the street and we assist at Arrels. We call on the political parties to bear in mind homeless people, to bet for housing, prevention and decent working conditions and to include solutions to homelessness in their manifestos. We promote sensitization to break prejudices and explain that people don’t sleep on benches and doorways because they want to but because their bonds have been broken and they don’t have anywhere else to go. We have to bear in mind that going out on the street is a slow process and solutions are not in the short term. We suggest to bet for mediation, speaking with the person, not judging him, asking for what he needs, settling relationships of coexistence, contacting with organisations and municipal healthcare services, orientating him towards resources he can use… We suggest not waiting until winter because living on the street is hard throughout the year and it is necessary predicting emergency situations. We ask for the involvement of the citizens to claim solutions to administrations, offer rent at affordable prices to social entities, sensitize the environment and collaborate to make possible #nobodysleepingonthestreet. 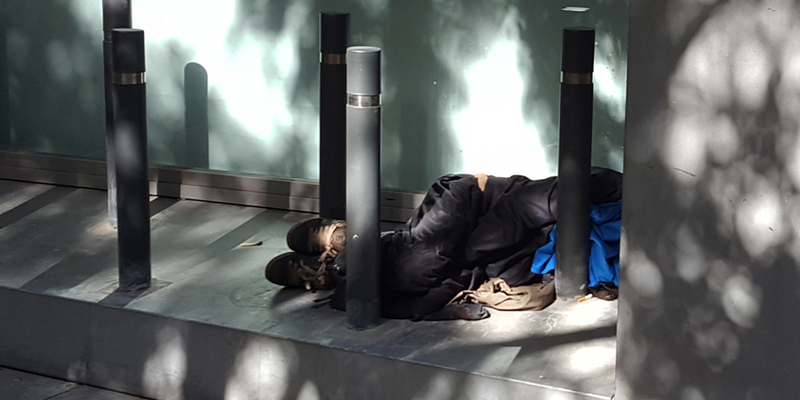 According to a survey made to the citizens by Arrels in 2016, 75% of the people in Barcelona consider homelessness an important problem and 4 of each 5 believe that human rights should be recovered because living on the street is not a normal. We invite you to make visible some examples that you find in your environment using the hashtag #arquitecturahostil in social media, posting the picture and the exact location in this collaborative map or inform us at comunicacio@arrelsfundacio.org. We claim access to a worthy and stable housing with social support so people that sleep on the street can recover their rights. While we move forward in this sense, we propose to open small, safe and welcoming spaces all around the city so anyone doesn’t have to sleep on the street. We would like that homeless people could make use of the public areas just like any other citizen and, as a society, we should be concerned about this issue so everyone can have a place to sleep at night. We are convinced that achieving #nobodysleepingonthestreet is possible, but for that, social healthcare policies are necessary as well as worthy housing addressed to homeless people and prevention policies so anyone doesn’t lose their home.